I like the Garfield strip...though it's gotten kind of hemogonized since so many people work on it...I don't know how much the creator actually works on it anymore. On one of the DVDs there was a feature showing us how a Garfield strip is made. First Jim Davis does the first draft. Then another person pencils it (outlining the draft with better definitions) and does the lettering. A third person inks it. And a fourth person colours it. BATMAN, SUPERMAN, THE JOKER and LEX LUTHOR all come together in the most action-packed superhero adventure of all time. When THE JOKER elicits the help of LEX LUTHOR in a fiendish new scheme, only the combined powers of BATMAN and SUPERMAN can save the city of METROPOLIS. Will the MAN OF STEEL and the CAPED CRUSADER be able to put aside their differences and foil the diabolical duo's evil plans? 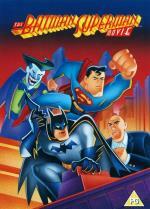 This movie is cut together from three episodes of the 90s Superman animated series (World's Finest Part 1-3). It is a very fun watch. Here Superman and Batman meet for the first time and also discover each other's identities. Lois Lane starts to date Bruce Wayne much to the dismay of Clark. But she dumps Bruce at the end after she found out that he is Batman. Also the teaming up of Joker with Lex Luthor is done wonderfully. This movie really holds up well as a stand-alone movie. It is not necessary at all to have seen anything from the TV shows. Blimey, Rog, that's before my time! I can't remember Garfield BO (Before Odie)... My earliest book is '83 and he's in that. From the makers of Notting Hill and Bridget Jones's Diary comes the ultimate romantic comedy. This blockbuster film includes a fantastic all-star cast and an outstanding soundtrack. The hilarious Love Actually explores the ups and downs of relationships in the weeks building up to Christmas. Boyfriends & girlfriends, husbands & wives, fathers & sons and rock stars & managers all combine to make Love Actually not just one story but ten very different ones. Because if you look hard enough you will find love actually is all around. Usually when you take an all-star cast and have countless of storylines going on at once, the result is a mess, because either one of the actors gets too much screentime, or too little. Or the most boring one gets the most, etc. But in this movie it all worked out great. Each of the storylines probably could have been a movie of its own. It is like watching all of this movies at once, switching between them to just see the important scenes of each. Raj (Abhishekh Bachchan) is a NRI living in New York who is against the idea of an arranged marriage. Raj visits India to attend a family wedding and is smitten by the beautiful Namrata (Aishwarya Rai), his uncle's colleague who happily agrees to help Raj find a suitable Indian bride. However, fate has other ideas for the pair as they soon realize that 'their love' is a match made in heaven. 'Kuch Naa Kaho' is a heartwarming romance to debutante director Rohan Sippy. Join them in their quest for true love, happyness and finding that perfect soul mate. A very predictable movie, which succumbs to be a bad soap opera in the second half including their infamous cue music. The synopsis sounded much more fun than the movie turned out to be. Though the movie had some fun scenes. This is the story of one man, his family and how they overcome the obstacles that life puts in their way, together. It is the story of human spirit and how it ultimately prevails. 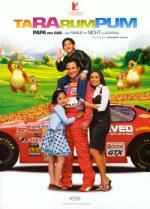 Rajveer Singh (Saif Ali Khan) is a pit-crew worker in a racing team with a passion for driving who gets discovered by a team manager, Harry (Jaaved Jaaferi). The same day he accidentally meets a music student, Radhika (Rani Mukerji), who he falls for instantly. He gets drafted into 'Speeding Saddles' - a failing race team and transforms from Rajveer Singh to 'RV' - the race car driver. While his racing career takes off instantly, his love life also blossoms after a whirlwind romance. A few months later, he is both a happily married man and one of the country's best racers. Fatherhood and greater success both follow and soon he is the Number 1 race car driver in the USA, as well as the proud father of two precocious kids - Priya (Angelina Idnani) and Ranveer (Ali Haji). But as a result of a bad racing accident, RV is hospitalized for a few months. When he tries to make a comeback, he realizes that he has been mentally scarred by the accident and has lost his edge. His life now takes a turn for the worse and after a string of failures, he is forced to auction his house and move with his family to a run-down Bronx-style neighborhood. However, RV and Radhika decide not to tell their children the truth and construct a skillful masquerade of a reality show where they have to live a poor life in order to win a mythical grand prize. The family struggles to survive a life that they are not used to, using a mixture of fantasy and cheerfulness to pull through in the face of adversity. But an incident forces RV to reclaim the life that was taken away from him. Can he, once again and perhaps for a last time, face down his inner demons on the race track? Can the family remain together in the wake of what could perhaps be their biggest challenge yet? The first half of this movie mirrors the Rocky movies. Main protagonist becomes an overnight star in sports (Nascar in this movie) At the same time he falls in love and marries, becomes kids. Then after an accident he looses everything and moves with his family to a bad neighbourhood. The second half shows how the family copes to being poor. The couple tries to hide the fact from the kids that they are really poor and that everything is only a game (I was reminded a little of the movie "La vita è bella"). And then finally he gets his chance to race again against the guy who caused the accident, which is similar to the movie "Talladega Nights: The Ballad of Ricky Bobby". It is a fun enough watch. Certainly not worse than "Talladega Nights". Suhani Sharma (Rani), a pediatric student in Mumbai medical college, was unlike many girls of her age. A bookworm who spent most of her time studying pediatrics and doing night shifts practicing surgery, Suhani never thought she could fall in love. But one day, a chance meeting with a stranger Aditya (Vivek) on a morning train to Marine Lines changes it all. It is a case of love at first sight. The two get married. Suhani gladly accepts whatever Aditya has to offer - a dingy room with unplastered walls, rickety furniture and a makeshift kitchen. Financial insecurities and ego hassles begin to drive a wedge between the happily married couple and the duo part ways eventually. However, deep inside both of them there still lingers their platonic love. Both know they cannot live ‘with or without’ each other. This movie is a little slow despite its relative short run-length. It had its nice moments. I liked Shah Rukh Khan's cameo appearance. I knew that he was in it, but I totally forgot it while watching the movie and I was surprised at his appearance towards the end of the movie. The songs were forgettable. Nothing catchy here. Comic superstar Bill Murray ('Ghostbusters', 'Caddyshack') teams up with Academy Award® winner Richard Dreyfuss ('The Goodbye Girl', 'Best Actor', '1977') in the year's most outrageous comedy. Murray plays Bob Wiley, a neurotic but lovable New Yorker who shows up at the vacation home of a pompous doctor named Leo Marvin (Dreyfuss). Bob soon becomes the houseguest who wouldn't leave, endearing himself to the other family members ...and in the end, driving the stressed-out Dr. Marvin absolutely crazy. Moviegoers loved this delightfully zany tale, and you'll find WHAT ABOUT BOB? full of lunacy, laughter and nonstop entertainment. Bill Murray is great as Bob. I feel that Monk has been greatly influenced by this movie. Bob reminds a little of Monk (though Monk is much more reserved). And Monk's doctor reminds me of Richard Dreyfuss's character here. Although Dr. Kroger (Monk's psychiatrist) never has been driven to madness like Leo was here (yet). A comedy of cosmic proportions, 'My Stepmother Is An Alien' is the story of dedicated scientist Steve Mills (Dan Aykroyd) who discovers extra-terrestrial life in the sensuous form of Celeste (Kim Basinger) - a girl literally out of this world! The two have much to learn from each other. For Dr Mills it's the untapped knowledge and secrets of another planet. For Celeste, it's discovering what kissing's all about. A match made in the heavens, the only shadow is cast by Jessie, Dr Mills teenage daughter who has difficulty in accepting her 'unusual' stepmother. 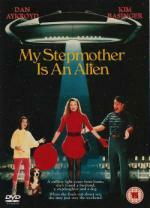 Both hilarious and touching, 'My Stepmother Is An Alien' wonderfully demonstrates how beings from two totally different planets are actually quite compatible after all. When a harmless Martian (Christopher Lloyd) crashes onto earth, and into the life of struggling TV reporter, Tim (Jeff Daniels), he must use all his magical powers to keep his identity a secret and quickly find a way back to Mars. Tim initially wants to expose the friendly Martian, whom he names,'Uncle Martin', and his crazy animated spacesuit, Zoot. Ultimately Tim helps Uncle Martin, but can he send him safely home before the world discovers thier secret? The fun part about this movie are the antics of Christopher Lloyd as Martin. He is just perfect at playing eccentric characters. Otherwise this movie is nothing special. Though I love the fact that Ray Walston (Martin in the original series) appears in a cameo as a Martian who has been waiting for 30 years on Earth for a chance to get back to Mars. In this must-see comedy hit, two carefree pals travelling through Alabama are mistakenly arrested and charged with murder. Fortunately, one of them has a lawyer friend in the family - Vincent Gambini (Joe Pesci), a former auto mechanic from Brooklyn who has never been in court - or in Alabama. 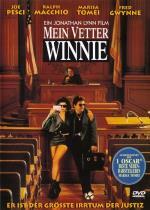 When cousin Vinny arrives with his leather-clad girlfriend (Marisa Tomei in her Oscar-winning supporting actress performance) to handle the case, it's a real shock for him and the deep south. The first half of this movie is interesting, though it drags a little. But I really like the second half, where Vinny is finally is getting his act together and proves that he really can be a good lawyer. There are some horrible rumours that Marisa Tomei got her Oscar by some sort of accident. I thought she was wonderful in this film. Actually, she's wonderful, full stop. But it's worth underlining. The rumors about her Oscar win cannot be true as there are officials at the side who would step in if something like this would ever occur.